Daymark offers Professional and Managed Services designed to help companies resolve their most difficult technology challenges both in the data center and the cloud. With 700+ complex implementations completed, over 350 technical certifications, a long history of happy, satisfied customers, and a reputation for technical excellence, we have established ourselves as a trusted IT partner throughout New England. Our 3:1 ratio of professional services to sales employees is further evidence of our consultative approach and demonstrates the value we place on being one of the most skilled and knowledgeable IT professional services providers. 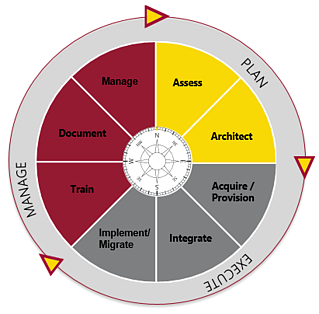 You'll appreciate our comprehensive eight-phase methodology. Our methodology is time-tested and proven to help our customers achieve their goals because we take the time to thoroughly understand where you are today, where you want to go, and then develop a comprehensive plan to ensure you bridge the gap. Our proven approach streamlines design and implementation while ensuring the right strategy, technology and processes are always put into place. Each of these phases can be delivered independently or in a series depending upon your unique needs.